The first significant Union victory during the U.S. Civil War. Sketch of the Battlefield of Logan's Cross Roads and of the Enemy's Fortified Position at and opposite Mill Spring, KY. This is an 1877 separate issue Edmund Ruger and Nathaniel Michler map of the American Civil War Battlefield of Logan's Cross Roads / Mill Springs. Located near present-day Nancy, Kentucky, the map depicts the region in two sections: one from the intersection of the Jamestown Road and the Somerset Road to a Confederate Field Hospital along the Mill Spring Road, and then from approximately 1.25 miles from Mill Spring across the Cumberland River to Mill Spring. 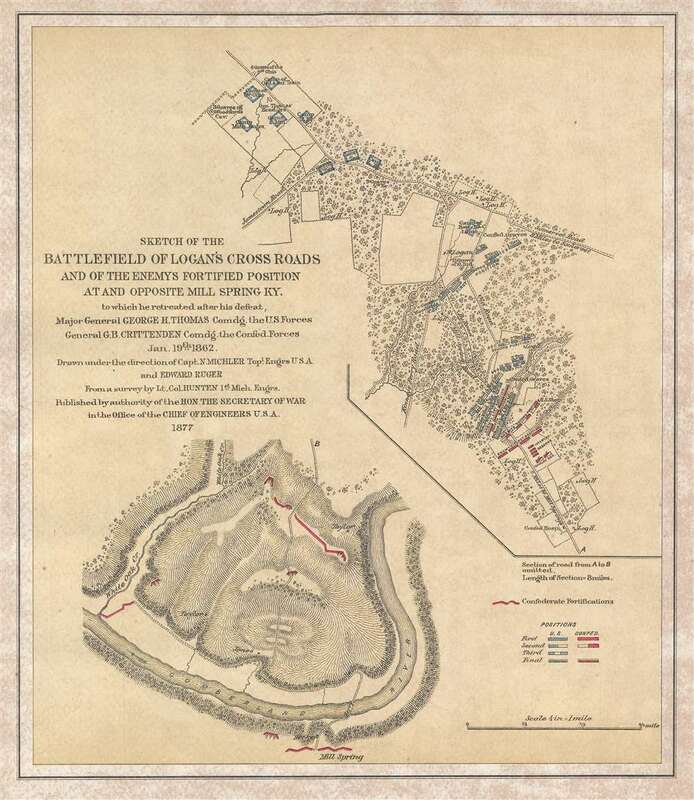 By separating the map, the cartographer was able to illustrate two separate actions (the Battle of Logan's Cross Roads and the Confederate entrenchment at Mill Spring) on the same sheet. In depicting the Battle of Logan's Cross Roads, numerous Union encampments are illustrated and labeled, as are positions occupied by both Union and Confederate troops. The course of the battle is also included by using shading to illustrate how the Union and Confederate positions changed throughout the battle; Union forces are marked with blue and Confederate positions are noted in red. This battle is known by three different names, depending on where the source referencing the engagement originated. It is known as the Battle of Mill Springs but is also known as the Battle of Fishing Creek in Confederate sources, while Union sources refer to it as the Battle of Logan's Cross Roads. Fought on January 19, 1862, the battle resulted in a Union victory and ended a Confederate offensive campaign in eastern Kentucky. This battle was the first significant Union victory of the war and was celebrated in the Northern press. Soon, however, the battle would be forgotten following Ulysses S. Grant's victories at Fort Henry and Fort Donelson. This map was drawn by Edmund Ruger and Nathaniel Michler and published in 1877. This piece is fairly well represented in institutional collections, but is scarce on the private market. Edward Ruger (September 16, 1834 - May 18, 1918) was an American engineer and soldier. Born in Lima, New York, Ruger (one of nine children) was the second son and third child of Thomas Jefferson and Maria (Hutchins) Ruger. Ruger's parents moved to several different towns within the state of New York during his youth, and at one point attended public school in Marcellus, New York. In 1844, Ruger's family moved to Janesville, Wisconsin, where he father served as a home missionary of the Protestant Episcopal church. In Janesville, Ruger attended public school and then the Janesville Academy, where his father was the first principal. However, Ruger only formally attended school for the three winter months of the year, with his father administering his schoolwork during the rest of the year so Edward could work on the family farm. Edward Ruger's father was an accomplished mathematician, which led the younger Ruger to study mathematics and a love of civil engineering and surveying. In 1857, Ruger opened a surveying office in Janesville, bringing with him experience surveying land for the United States, subdividing sections, and making preliminary and locating surveys for railroads and their construction. Ruger was elected city engineer of Janesville in 1859, and county surveyor of Rock County in 1860. He gave up these posts in 1861 when he enlisted in the Union Army and was enrolled as captain of Company A, Thirteenth Wisconsin Volunteer Infantry. He and his regiment left Janesville in January 1862 and moved their way south to Kansas, eventually to Fort Riley. After leaving Fort Riley, he and his regiment were given the task of rebuilding bridges that had been destroyed by Confederate troops. Eventually, Ruger was named a topographical engineer and served in such capacity on the staffs of Major General Lovell H. Rausseau and Major General George H. Thomas. When he joined General Thomas's staff, he was placed in the position of superintendent of the topographical engineer's office of the Army of the Cumberland, a post he kept until 1869. He made surveys and drew maps of the operations of the Army of the Cumberland during the war and the operations of the Armies of the Tennessee and Ohio during the Atlanta Campaign. When Ruger returned to Janesville after leaving the Army, he again opened a civil engineering and surveying office. Beginning in 1874, he was almost completely engaged in hydraulic engineering, receiving contracts in that field from twenty-three different states. Ruger married Sarah B. Wright on August 23, 1862 in Janesville during a thirty-day leave from the Army. He and Sarah had two sons, Frank and Harry. Nathaniel Michler (September 13, 1827 - July 17, 1881) was an American military officer and mapmaker who served during the American Civil War. Born in Easton, Pennsylvania, Michler attended West Point, from which he graduated seventh in his class. Commissioned as a 2nd Lieutenant in the Topographical Engineers, Michler participated in the Mexican Boundary Survey from 1851 until 1857, when he was transferred to serve as the chief topographical engineer in surveys for a proposed canal from the Gulf of Darien to the Pacific Ocean from 1858 until 1860. He held the rank of Captain at the outbreak of the American Civil War and served with the Army of the Cumberland from 1861 - 1863, then was transferred to the Army of the Potomac and built defensive works for the Union Army at the Battles of the Wilderness, Spotsylvania, Cold Harbor, and Petersburg. He was promoted to Colonel in August 1864 and brevetted Brigadier General in April 1865. After the war, Michler served as superintendent in the District of Columbia until 1871 and from 1872 to 1875 was chief engineer with the General Commanding Division of the Pacific. He acted as military attaché for the United States Legation in Vienna, Austria from 1878 to 1880.